Voter suppression efforts are increasing across America. It's time for a new Voting Rights Act. Making good on the promise of democracy requires ending state officials’ ability to be picky about who gets to vote. Governor Rick Scott, R-Fla., and members of his cabinet convene four times a year to choose a few dozen individuals (out of the 1.7 million Floridians who are disenfranchised due to a felony conviction) whose voting rights they will restore. Perched on a raised dais like princes hearing from supplicants, they enjoy full discretion as to who to re-enfranchise — and on what grounds. Scott’s statement encapsulates many people's view of voting rights in today’s United States, where the franchise of millions is subjected to the capricious whims of a few public officials. State-level politicians enjoy wide discretion to play electoral gods, and they do so away from the spotlight and with little accountability. Politicians’ discretion to fiddle with electoral rules greatly intensified in 2013, when the Supreme Court struck down the Voting Rights Act requirement that jurisdictions with a history of racial discrimination gain federal approval when adopting electoral policies. According to the Brennan Center, jurisdictions previously under federal preclearance have since purged far more names off of their lists than other jurisdictions. A separate study by the Leadership Conference Education Fund documents the alarming rate at which these same jurisdictions have been shutting down polling places since 2013; for instance, 212 voting locations closed in Arizona alone in the run-up to the 2016 elections. The broad discretion and mean use of it has been at the forefront of the news recently because of Georgia Secretary of State Brian Kemp, the Republican nominee for governor in next month’s election. He had already been at the forefront of both the excessive purge of voter rolls, and the closure of voting locations in predominantly poor and minority areas and, last week, the Associated Press exposed that Kemp’s office has put 53,000 voter registration forms on hold because they ran afoul the state’s “exact match” test. The test means that a slight divergence between the applicant’s name on the registration form and on existing government files — say, a missing hyphen or an added accent — is enough to put an application in limbo. Around 70 percent of the frozen applications are from African Americans in the state. The problems in Georgia highlight the urgency of adopting strong federal protections for electoral access in the form of a new Voting Rights Act, if not a constitutional amendment. It wouldn’t shield the franchise from congressional revisions and Supreme Court decisions, but it could reduce state and local officials’ discretion to quickly and quietly restrict the electorate or cherry-pick who is allowed to vote. Reforms to this effect can be advanced at the state level, though, even absent federal intervention. First, states can shift the burden of registration from voters onto the state to make it easy, if not automatic, to register rather than allowing the state to take advantage of every opportunity to knock off applicants and registrants. For instance, public authorities already have a lot of information on file and have a multitude of contact points with citizens — when people access social services, pay taxes, register for social security and shop for health care. In 1993, a federal law mandated that people be given the opportunity to register at many of these contact points. But, we can go much further in requiring that public authorities proactively ensure that every eligible person is registered and fully use information that public authorities already have on file — and some states have newly adopted automatic voter registration laws. Fully 6 million Americans are currently disenfranchised because of a felony conviction. Most egregiously, 34 states bar people from voting even after they are released from incarceration if they are on probation or parole; four states go so far as to permanently bar them from voting, even after they complete their sentence Florida is one of the most problematic such states, though hardly the only one. According to the Sentencing Project’s 2016 estimates, more than 10 percent of Florida's voting-age population — and 21 percent of black adults — are disenfranchised, four times the national average. Upon becoming governor, Scott implemented the aforementioned case-by-case process by which anyone who completes a felony conviction must petition for their rights and wait roughly 16 years for a hearing. A November ballot initiative, Amendment 4, would, if passed, automate rights restoration for people who complete most felony convictions, enfranchising nearly 1.5 million people in one fell swoop -- compared to the roughly 3,000 individuals whose rights Scott has restored since 2011. 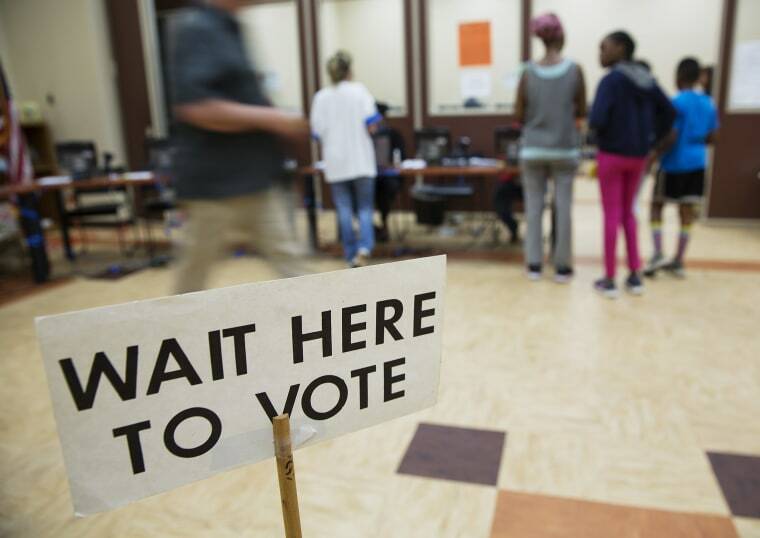 Other states are looking to go further and to entirely remove the state from the business of determining who should lose the right to vote by eliminating all felony disenfranchisement, as is already the case in Maine and Vermont. A complex muddle of rules surrounds both voter registration and felony re-enfranchisement, which enables public officials to be selective about when to educate citizens about their rights, and when to prosecute and imprison (or refuse to register) some of the individuals — predominantly African Americans — who get the opaque information wrong. Access to the franchise has faced limits throughout American history; making good on the promise of democracy requires ending state officials’ ability to be picky and selective. Daniel Nichanian is a Senior Fellow at the Justice Collaborative. He has a PhD in political science from the University of Chicago.